Remember how exciting it felt to ride on your parent's shoulders? It felt like there was nothing that could stop you unless your dad stopped walking around for some reason or another. You could see everything from up there. Uncle jerry's bald spot, the top of the refrigerator where your mom stashed the 'nilla wafers, you could even pat your oldest siblings head. There was nothing that made you feel more important than that piggyback ride. Now you're older, your dad can't quite lift you anymore. You know because you tried at Thanksgiving, yeah, we don't know why he was so crabby about it either. Wait, don't look so sad, there's still a future for your piggybacking days! You'd think because he doesn't have any muscles that this skeleton wouldn't be able to lift you. But that's like assuming that he wouldn't go to a party because he doesn't have any guts, he might be only bone but he's brave and he's strong and he's willing to give you a boost. It's too bad that your piggybacking days had to continue in this macabre manner, but hey, better than nothing, right? Now, how did we train a skeleton to carry people around? We'll tell you a secret. You actually do the work. 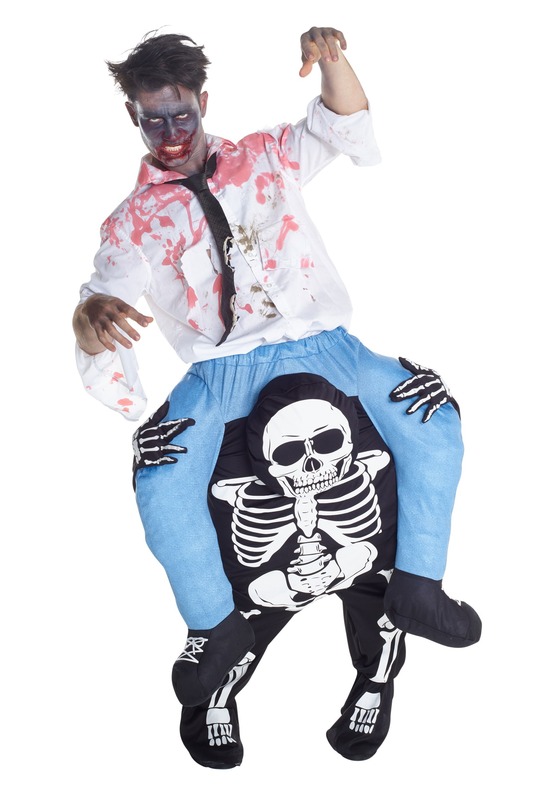 You simply put your gams in the skeleton and wear him like a pair of pants. It looks just like he's trying to carry big ol' you. If you want a real piggyback ride, try getting your pa a set of weights for his birthday, you'll be reliving memories in no time.